All you need to make these Dark Chocolate Sea Salt Coated Almonds your next go-to healthy snack is the following: 1 1/2 cups of whole Almonds, coarse Sea Salt, Turbinado Sugar (or raw sugar – I had neither and went with sugar crystals we use for baking, and 6 ounces of semi-sweet chocolate (I used a good quality since it’s going to be the star of the show). Start off by getting water boiling in your double boiler. 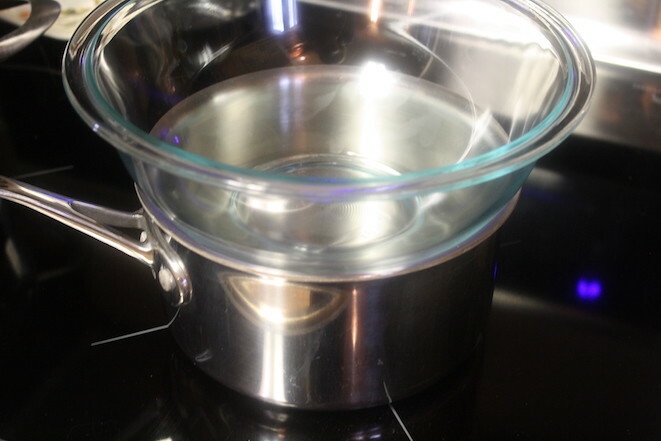 I always make my own double boiler with a small sauce pan and a glass bowl. Pro tip: The key is to make sure your water level is low enough that when it boils, it doesn’t touch the bowl or you’ll burn the chocolate. As the water comes to a boil, line a baking sheet. I used parchment paper, but a Silpat works perfectly too. 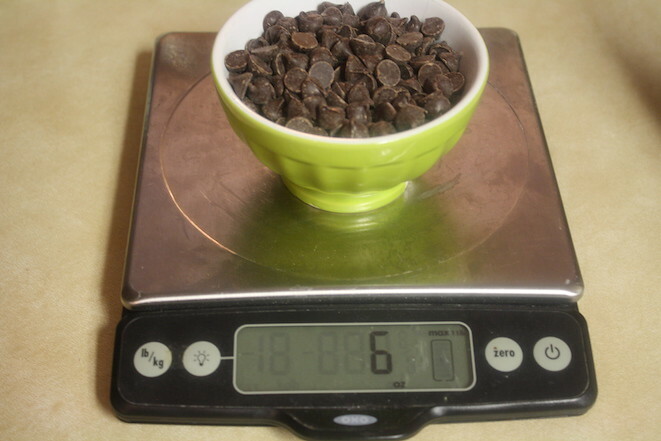 Weigh out your chocolate so that you have 6 ounces. 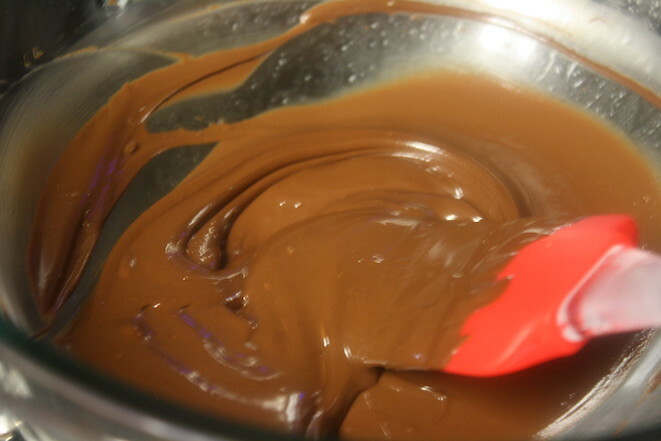 Then add the chocolate to the glass bowl once it’s boiling. (See directions below if you have to use a microwave.) 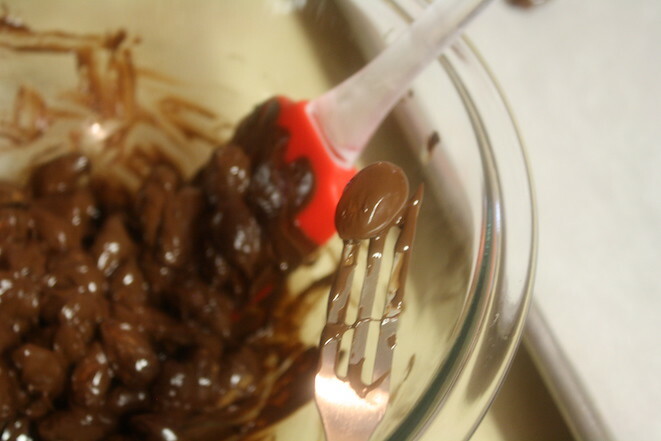 Stir the chocolate regularly as it will melt quickly. Here it is in it’s melted glory . . . yum! 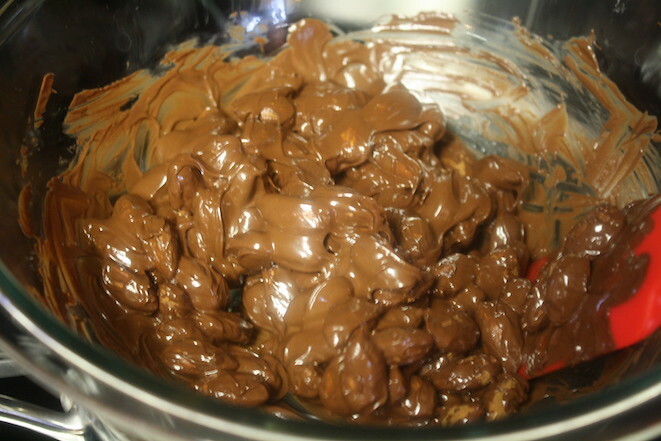 Then add the almonds to the chocolate . . .
. . . then stir the almonds until they are well-coated with chocolate. Again I say yum! Use a dipping fork, or I used what we in the Wallace household call a “granny fork”, to transfer the almonds to the lined pan. The fork is really helpful to help you tap it on the edge of the bowl to remove the excess chocolate. I found it useful to transfer 1-3 almonds at a time to the lined pan. The important thing is to separate the almonds on the pan, so that they don’t clump on the pan. It makes it easier to store and snack on. 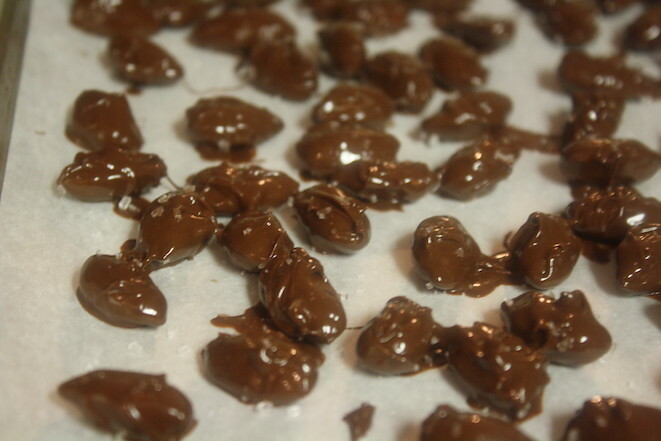 Here are all of the chocolate coated almonds. It will take a bit of patience and time to transfer all of the almonds to the pan, but hang in there, because it’s so worth it. 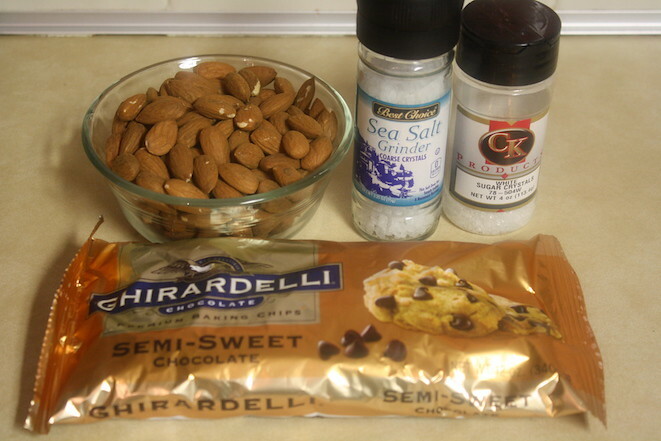 Finally, coarsely grate the sea salt and sprinkle the sugar over the top of the almonds so each almond has a little bit of both on them and you’ll have Dark Chocolate Sea Salt Coated Almonds! 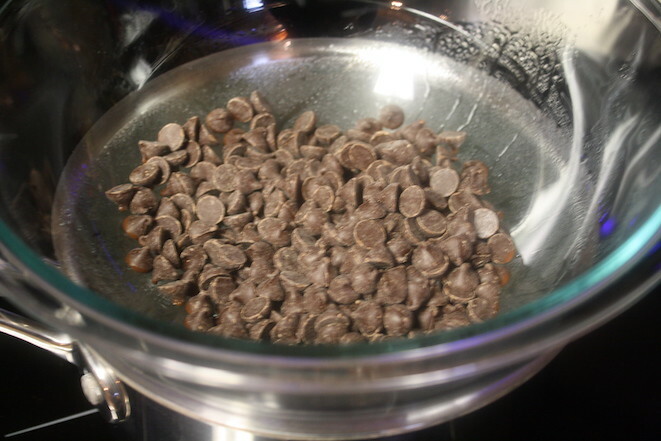 Then set the pan aside and let the chocolate set up for a few hours. (You can speed it up in the fridge if you’d rather.) You can keep the finished Dark Chocolate Sea Salt Coated Almonds in your fridge for up to 4 weeks if they are stored in an air-tight container. Happy snacking! These almonds make for a perfect, healthy snack to keep on hand! Begin by lining a rimmed baking sheet. 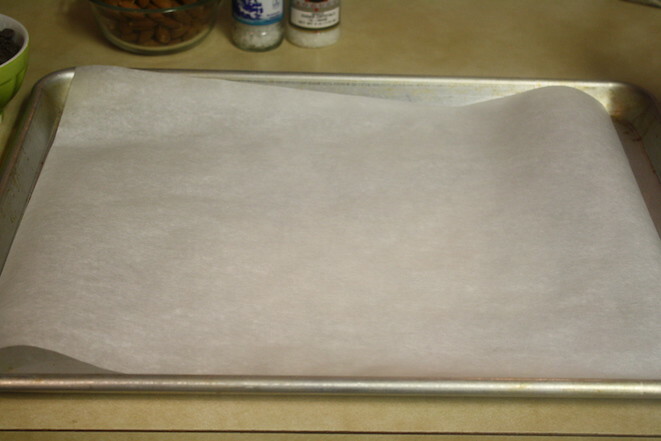 I used parchment paper, but a Silpat is another great option. 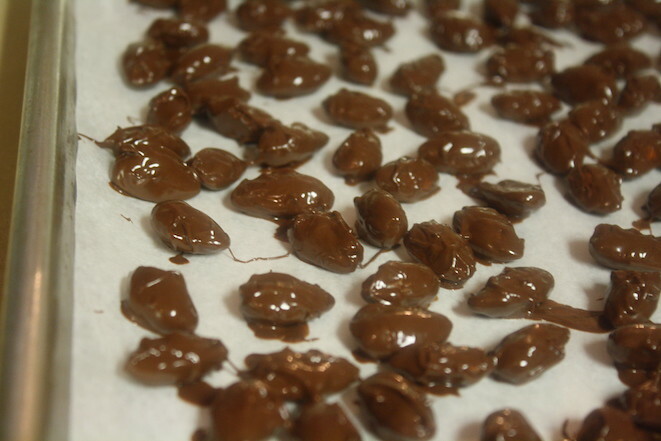 Once the chocolate has melted, remove it from the heat and stir in the almonds, combining so that the almonds are completely coated in chocolate. Using a dipping fork, you’ll lift 1-2 almonds out of the bowl at a time, tapping the fork to let the excess chocolate drip off. Transfer each almond to the baking sheet and try to separate them so they set up individually and aren’t in clumps. 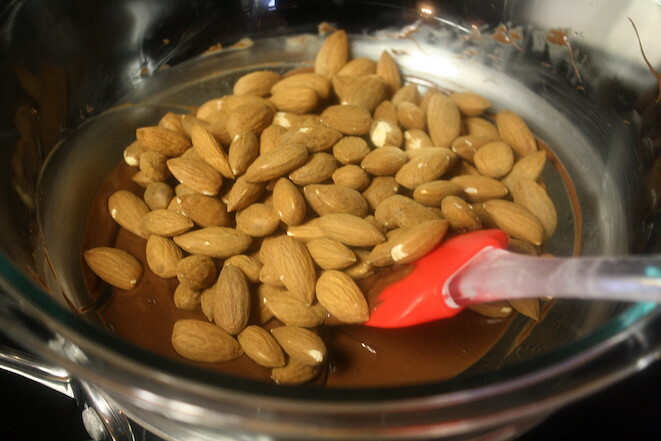 Finally once all of the almonds are coated and transferred to the sheet pan, you’ll top with coarse sea salt and the turbinado sugar sprinkling the salt and sugar over the almonds so each almond has a little of each. Let the chocolate sit untouched for a few hours until the chocolate has set up. (You can speed up the process by placing the baking sheet in the refrigerator for an hour or so.) Then store in an airtight container in the refrigerator for up to 4 weeks and enjoy! 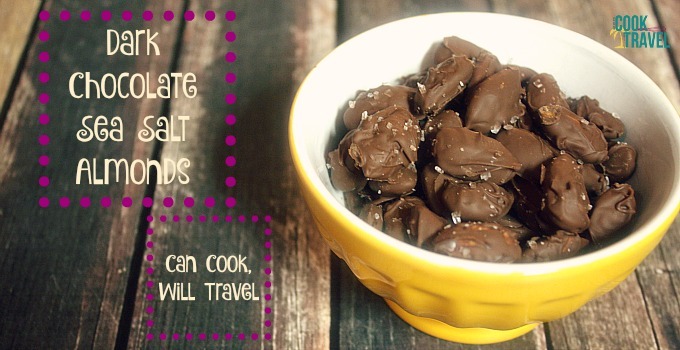 Previous Post: « Dark Chocolate Sea Salt Almonds Make Healthy Snacking a Breeze!